You asked what you wanted, and now Bon Jovi answers! Jon Bon Jovi and David Bryan have huddled up and responded to your questions. Get One to One with the Jersey Boys. Read on. Q: I really love your new album, Crush, but I noticed that it has a different musical style to it. Do you agree and do you think your writing style has changed over the years? If so, how? Jon Bon Jovi: Sure, it's changed as we've changed. I'm proud of each of the records at the time of their release, and yet there are gonna be a few that stand the test of time forever (I hope). Q: Jon, after all these years of touring, and the past eight albums, do you still get that adrenaline rush before you go out on stage? - Joann from Westerly, R.I.
Jon Bon Jovi: Sure, the most important thing is the last 5 to 10 minutes leading up to the show. You have to get as psyched for Boise, Idaho, as you do in London and New York. Q: How do you think "good ol' rock 'n' roll" can overcome the boy bands and girl bands that seem to rule all the charts today? - Caryn from Orlando, Fla.
Jon Bon Jovi: Don't try to compete with any fad. There's room for everyone. If fact, there are some lessons to learn from all of them. Q: What is it like on the opening night of a new tour? - Jessica from Paris, Ark. David Bryan : It is a great feeling. Finally after all the preparation and practice it's time to do the show and have fun. Q: How has your audience changed from, say, 1984 to now, in 2001? - Nichole from Chula Vista, Calif.
Jon Bon Jovi: It's bigger. They're there to see us and challenge us to surprise them with a great show. In the beginning we were eager to prove that we were different than our peers, but that took time and persistence. Slippery began the true Bon Jovi era. Q: How many hours of sleep do you average while on the road, and what do you do to entertain yourselves while touring? - Kashmir from Rancho Cucamonga, Calif.
David Bryan: I usually sleep for 6 or 7 hours a night. Sometimes I play golf or tennis when I have a day off. Q: Did you guys ever think that you would make this big of a comeback after the big split in the '90s? How does it feel to be back? - Charlotte from Apple Valley, Calif.
Jon Bon Jovi: We never split up - I can't say that enough! In '94 we released Cross Road and began to tour. During that tour (in June '95) we released These Days and toured well into '96. There wasn't a lot to say lyrically as a band, so a very mutually agreed upon two years to pursue solo projects and movies was set into place. True to our word, I presented 30 songs to the band in September of '98. With the sale of PolyGram to Universal, we wrote 30 more and waited for the merger. The result made it worth the wait I think. 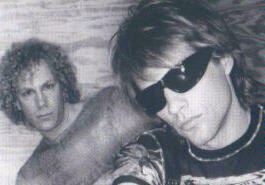 David Bryan: I don't think we ever broke up, so it's not really a comeback, just a continuation. It feels great to have a new record out and touring on it. Q: How do you decide which songs you will play at each concert, and is there a favorite that has to be in each set? - Michelle from Schenectady, N.Y.
Jon Bon Jovi: The basic hits are there nightly, but we do cater the set to how we feel and what part of the world we're in. "Something for the Pain" was a bigger hit in Europe so we may do that. The ballads are tough because I don't want to do more than two on any given night, and there are certain album tracks, even on Crush, that we love but don't go over as well. Q: If I were stranded on a desert island, and I had never heard of Bon Jovi, what song would you have me listen to that would give me the best idea of who you are? - Kathleen from Mesquite, Nev.
Jon Bon Jovi: "Wanted Dead or Alive," "It's My Life," "Livin' on a Prayer," "Blaze of Glory," "Bed of Roses," "You Give Love a Bad Name," "Keep the Faith"... I could go on but they'd have to rescue us or you'd kill me. David Bryan: "Wanted Dead or Alive" and "Livin' on a Prayer." Q: Hollywood decides to make the Bon Jovi story. Who plays each member and what's the tag line on the poster? David Bryan: Jon - Kevin Bacon; Richie - Frank Stallone; David - Ben Stiller; Tico - Antonio Banderas. Tag line: They set out to be the biggest band in the world ... and they did!!! Q: How long did any of you guys play your respective instruments before you got up in front of an audience to perform? - Cale from Greenville, N.C.
David Bryan: I started piano at 7 and played in my first band at 13. Q: If you were not musically successful, and had to work a "normal" 9-5 job, what -would it be? - Christine from Wheeling, Ill.
Jon Bon Jovi: President of the world. Q: When meeting a fan, is it uncomfortable for you if they are crying or not able to talk, or is it something that you understand? How would you like your fans to react when they meet you? - Aimee from St. Clair Shores, Minn.
Jon Bon Jovi: Striking up a regular conversation that doesn't begin with "I want," "Give me," "I bought" - I'm trying to keep people happy as well as myself. Q: What do your younger kids think of your jobs? Do they realize their daddy's popularity? - Tracy from El Dorado, Ark. Jon Bon Jovi: Daddy's job was introduced to my daughter by the time we lived in London as her day schoolteacher told her I was "Jon Bon Jovi." That made for more interesting conversation at dinner than at school. Now they get it but don't flaunt it. There are other kids whose parents are celebrities in the school but they don't seem to flaunt it either. David Bryan: They think my job is cool, yes. Q: Do you guys see yourselves rocking 20 years from now? - Krista from Lee's Summit, Miss. Jon Bon Jovi: It takes all the king's horses and all the king's men. I was drinking a club soda in the bar complaining of a bad throat when in walked Don Henley on antibiotics and Timothy B. Schmit drinking club soda. Those outside dates in Scandinavia at the end of May are cold! Q: The press has been declaring rock dead for several years now, but it seems that bands like Bon Jovi are keeping it alive and kicking. How do you feel about the pressure put on your band and other bands such as U2, R.E.M., and Aerosmith to keep rock alive? - Liz from Brighton, Ill.
Jon Bon Jovi: We're all doing well. Here in Europe alone, the Eagles, Madonna, Alanis, Neil Young, R.E.M. and ourselves are rocking - not to mention Ozzy, Limp Bizkit, and AC/DC. Q: What are your favorite things to do away from the music scene? - Samantha from Escondido, Calif.
David Bryan: Sports and motorcycle driving. Q: How difficult is it to get into being back on the road after being away from touring for so long? Is it exciting or a little lonely? - Shari from McVeytown, Pa.
David Bryan: It's not that hard. It's both exciting and little lonely. It's fun to tour, but I miss my family when I'm away from them. Q: How does it feel to have your fans sing your songs when you play live? Jon Bon Jovi: It's great. It gives me such energy, and the feeling that those lyrics meant something to them makes it really worthwhile. Q: What, in your opinion, do you think is the best album you have ever made? - Nicole from Jasper, Tenn.
David Bryan: I love them all. Q: Who do you listen to? What is in your CD player now? - Jennifer from Kewanee, Ill.
David Bryan: I listen to a lot of music. Right now I really like the new Train record and the Lifehouse record. Q: Where and when was the first time you heard one of your songs on the radio? How did you react? - Valerie from Watervliet, N.Y.
David Bryan: I was in my car in 1984. I felt like I really made it. Q: What are the plans for the band when the tour is over? - Rachel from Fort Atkinson, Wis.
David Bryan: To do a new record to have out in 2002. Q: If you could have dinner at your home with the three artists who have inspired you the most, who would be there? - Reva from Hot Springs Village, Ark. Jon Bon Jovi: Perhaps Tom Waits for the insight, Harpo Marx for the laughter, and Jesus 'cause we all have a lot of questions to ask him. David Bryan: Mozart, the Rolling Stones, the Beatles.